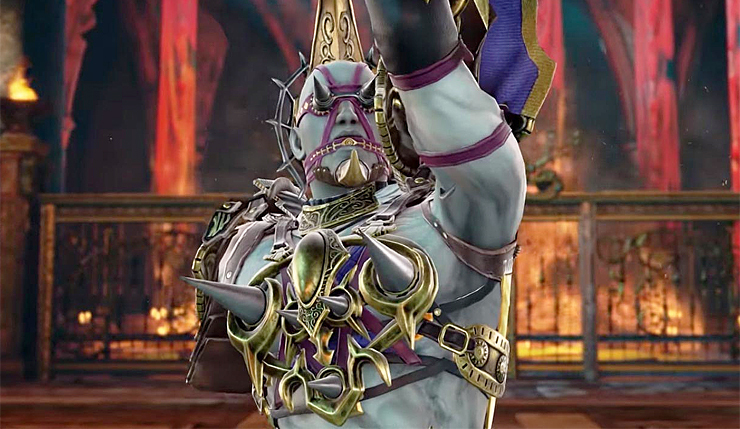 Soulcalibur VI has added the bizarre spiked-codpiece-sporting Voldo to its ever-expanding roster. Voldo has been bringing freaky flair to Soulcalibur since the beginning, appearing in every game in the series to date. Check out Voldo in all his spider-walking, hip-thrusting glory, below. Fan-favorite Voldo returns with his signature style and maniacal moves. Voldo is a long-time character in the Soulcalibur franchise, being one of only five characters to show up in every main installment. Voldo was the right-hand man to Vercci, an arms dealer with the nickname “Merchant of Death”, and was tasked to protect the Money Pit, where all of Vercci’s treasures were kept after his death. After spending years in the dark depths of the Money Pit, Voldo lost his eyesight but gained a heightened sense of hearing and awareness, making him extremely deadly to those who dared to enter the Money Pit in search of riches. Both longtime fans and new players will enjoy the exotic gameplay that accompanies this distinctive character in Soulcalibur VI. In addition to newly-revealed Voldo, Talim, Maxi, Yoshimitsu, Sophitia, Mitsurugi, Kilik, Nightmare, Xianghua, Ivy, Zasalamel, Siegfried, Taki, the Witcher series’ Geralt, and new character Grøh have been confirmed for Soulcalibur VI. It’s unknown exactly how many fighters Soulcalibur VI will launch with, but there can’t be that many more characters left to announce. What other classic Soulcalibur characters might join the roster? Dammit, I’m still holding out hope for my old favorite, Seong Mi-na! Soulcalibur VI hacks and slashes its way onto PC, Xbox One, and PS4 on October 19.